After a long wait, we finally have new foster students! We are fostering for a different organization this time, Heart of America Humane Society. They are a foster based group in the Kansas City area. They pull animals from municipal shelters in the area. They needed kitten fosters and our school was open so we said we would be happy to help. We have four students. They were found separately and are not related. We decided to pay homage to one of our favorite fictional cats, Mittens from Text from Mittens by naming the kittens after Mittens and his friends. These kittens won't be with us long. They are almost big enough to be spayed and neutered but they need to be socialized a bit first. They like humans but they need to learn how to play with other kittens. For example, Mittens is a bit socially awkward when it comes to other cats. She growls and hisses at other kittens. She has fun playing with them and forgets to growl. Once they stop, she starts growling again. The kittens look at her like "Guuurrrlll, you're crazy!" We're sure with the proper coaching Mittens will be the most popular girl at school in no time! 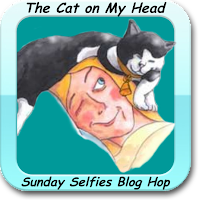 We are participating in The Cat on My Head Blog Hop. Please hop on over to view the other participants. They will have no trouble getting adopted. Those three are a delight, and I'm sure you'll get them to be playing like kittens in no time, and from there it is a small hop skip jump and a mouse to a forever home! They look like excellent students. They look lovely students and I know-all leave you with their heads and tails held high!